Today in this article I am going to write about expense manager iOS app for iPhone, iPad, iPod. As the name is already defining itself, the expense manager app is developed for helping you calculate the monthly expense on your fingertips. The expense manager app is very easy to use and it is available to download for Android, Windows and definitely iOS. Let me tell you one thing if you are earning good but you are not tracking your expenses then you are doing a big mistake. Because if you are not calculating your expenses then there are more chances that you are wasting your money in unuseful or unnecessary things. Tracking your monthly expense will make your life easier and better and you will be able to save money for sure. 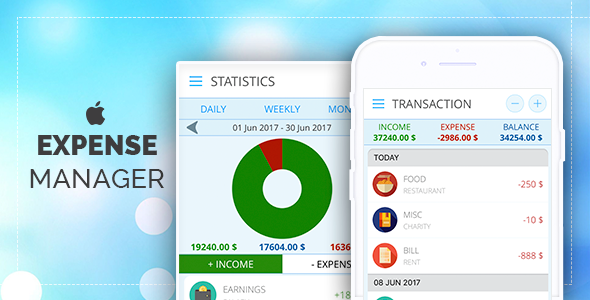 Don’t worry if you are not familiar with this type of monthly expenses calculating apps, cause it is a very simple and user-friendly app which you can effectively use with no issue. So let’s dig into the expense manager app iOS and learn more about the expense manager and its features. Are you already using an expense tracking application on your iPhone? or you are still calculating your expenses on a spreadsheet or white paper? If you are one of them then it’s time to change your habit and let your phone be the calculator of your expenses. In today’s time, smartphones are no more used only for calling purpose but these are used for many other reasons. For example: Playing games, Playing Music, videos and also for running useful apps which makes our life easier. Expense manager app is one of the apps which make our life easier and help us calculating our budget. Calculating monthly expense is not the only feature of the app but there are many more features and tools which help us to manage our finances. Well, now you might have a good understanding of the benefits of using an expense managing app. So now let’s talk about its features. Below I am writing some most popular features of the application and I hope you will like them. With the help of expense manager app, you can track expense and income by weeks, month or years and also categories. Get the payment alerts on the application. You can create multiple accounts with multiple currencies using Expense manager. You can schedule and recur the payments on the app. Create budgets by the Day, Week, Month and year. You can also import and export account activities in a CSV file. You can take a picture of receipt by the built-in feature of the app. The app is completely free and no extra charges are included. These are just some top features which I have told you but there are many more features. And you can utilize them while using the expense manager iOS app on your iOS device. Now I have told you all the features of Expense manager iOS app but there are some tools as well which will help you to do your tasks more easily. So let’s talk about the Expense manager tools. All the tools you will get into the expense managing app for iOS are given below. Downloading and installing the expense manager app on your iPhone or iPad is very simple. Just follow the simple steps given below and download the app. Install it on your iPhone, iPad or any other iOS device. Now open the app and start using the app. So this is all about the expense manager iOS App and I hope you find this article heLpful and useful. If you like this article then don’t forget to support us by sharing this article on social media with your friends and keep visiting us.